Laparoscopic reconstructive surgery has been applied to one of the most difficult repairs urologists perform, vesicourethral reanastomosis following radical prostatectomy. First attempted clinically in 1992, research work in animal models continues (105). In combined canine series of 20 animals, the radical retropubic prostatectomy and reconstruction was accomplished with a mean operative time of 294.5 minutes (106,107). In the study by Moran et al. the laparoscopic reconstruction was performed with the laparoscope closely approximated to the tissues for a microscopic repair. Six to eight fluorescently colored polyglactin intracorporeal sutures were placed utilizing microsurgical suspension techniques to convert square knots to slip configurations and back (Fig. 8) (106). 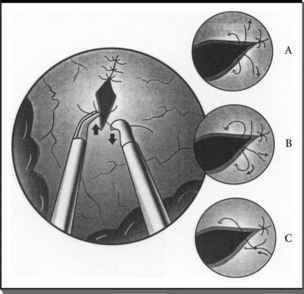 No Foley catheters were positioned so as to evaluate the completeness of the microlaparoscopic repair (Fig. 9). One anastomotic leak occurred in six animals available for long-term follow-up. Minimal scarification was noted grossly or on trichrome stained sections in animals at necropsy (Fig. 10) (106). FIGURE 8 ■ Suspension stitch technique for converting square knots to slipknots. FIGURE9 ■ Voiding cystogram following laparoscopic radical prostatectomy and microsurgical vesicourethroplasty in a canine model. sutures compared to eight using the adhesive. Only one of the adhesive animals anastomoses had leak pressures 70 mmHg or greater whereas all four control suture animals achieved this expected outcome (114). Laser welding has also been attempted in the canine model to facilitate this anastomosis. This was an open radical prostatectomy model, but four animals had a conventional eight interrupted suture technique while the experimental group had four support sutures followed by a diode laser welded anastomosis using a chromophore doped albumin solder. They noted superphysiologic leak pressures in all of these animals with no other differences in healing (115). 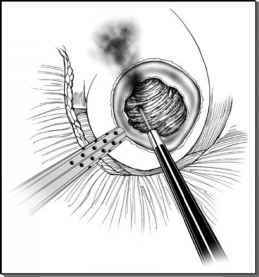 FIGURE 10 ■ Gross pathology of laparo-scopic intracorporeal reconstruction eight weeks following radical prostatectomy.